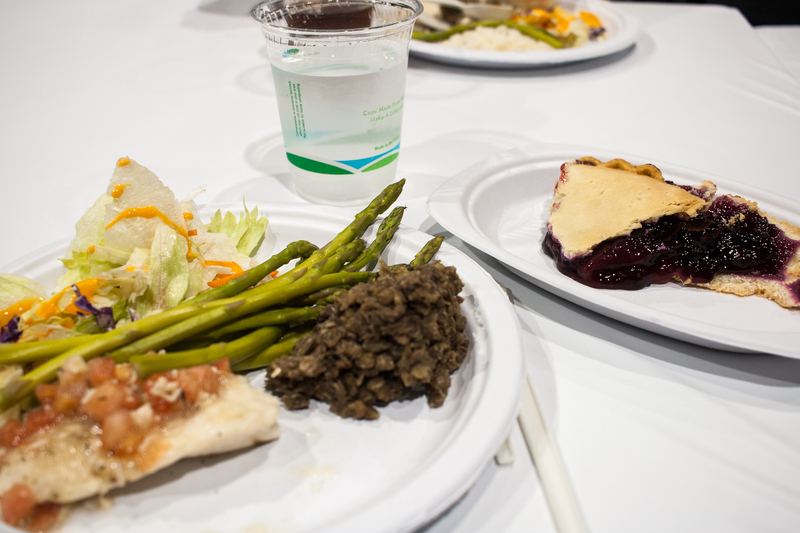 Every lunch and dinner at the conference last month included a giant bowl of iceberg lettuce. There were different dressings and toppings for the lettuce at each meal. If that had been the only vegetable option, it would have been a little sad. Instead, there were generally at least two other veggie choices and I was impressed with the variety and flavour of meals cooked for seven thousand people. 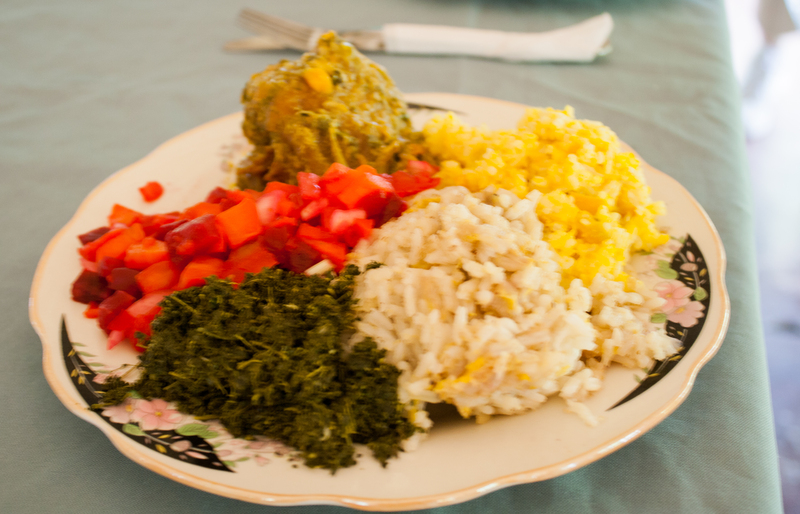 Every single meal I have eaten with Colombians over the past four years has been centered around rice. Until the second last meal in Harrisburg, when I finally blurted out how tired I was of rice in response to a colleague’s despair over six days of lettuce, I had never expressed my boredom with rice to Colombians. In fact, I feel very little liberty to complain about anything in Colombian society to Colombians. I generally say nothing about air pollution, traffic, public safety, really long meetings with no direction, and especially, the food. Colombian food is not my favourite, besides the mayonnaise flavoured potato chips. A popular dish, the Bandeja Paisa, consists of ground beef, pork rinds, fried eggs, beans, rice, sausage, arepas, and avocado. It’s not that it tastes bad, it is just greasy, salty, kind of bland, and an exercise in excess that usually involves two recovery days, just like poutine. Last week, I saw a woman sitting on a park bench eating cold hot dogs out of can. The same little sausages are the most popular items ordered from a colleague’s catalogue side business and have become a popular breakfast item, alongside soda crackers. Yesterday, I found, tucked inside my power bill in the mail, a coupon for a breakfast combo from a local coffee shop: a cappuccino, a deep fried pastry with cheese, and a green jello cup. When did jello and hot dogs become breakfast foods? But more than anything, I am tired of rice. Leftover rice for breakfast, rice mixed with pasta, rice pudding, rice mixed with tuna, chicken, salty cheese and quail eggs, with chicken flavoured potato chips on the side. Yet is was not until I was surrounded by one hundred Colombians, the majority very vocally expressing their dislike of lettuce and overly sweetened lemonade, that I realized that I also have a voice. Ever since returning to Colombia, I have had multiple conversations with fellow foreigners about our fear of complaining, several of whom even gave up vegetarianism, just to make things easier for our communities. Why don’t we feel like we have a right to express our own feelings to Colombians when they often show no hesitation in expressing their feelings to us, in our home contexts? When are our personal opinions valid? 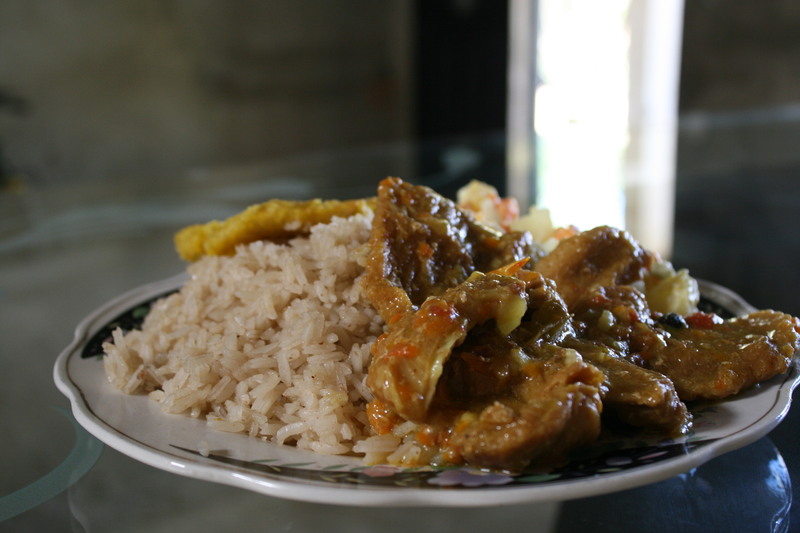 Are we so afraid of creating conflict or replicating colonial patterns that we go to the opposite extreme of over-the-top praise for a plate of rice? As I mull over these thoughts, I keep on remembering my first week on the coast. It has slowly faded into a blur of confusion, but The Great Chicken Killing Day of 2011 still stands out. I was invited to accompany the culmination of the San Pablo school’s productive project: the butchering and sale of hundreds of chickens. There were people chasing chickens, plucking chickens, killing chickens, weighing chickens and gutting chickens, yet I was forbidden from doing anything because I was the special international guest. In an attempt to make me feel useful, I was finally allowed to write down the weight and price of each chicken. Yet when people scurried to get a fancy chair for their international visitor and wondered what they would feed me, Juana waved away their concerns. “Anna can sit anywhere and eat anything. She is like one of us.” So I sat in my plastic chair and ate my chicken and rice, just like everybody else, confident (and also dreading) that doing so was one small step closer to gaining enough trust to be allowed to someday also pluck the chickens. 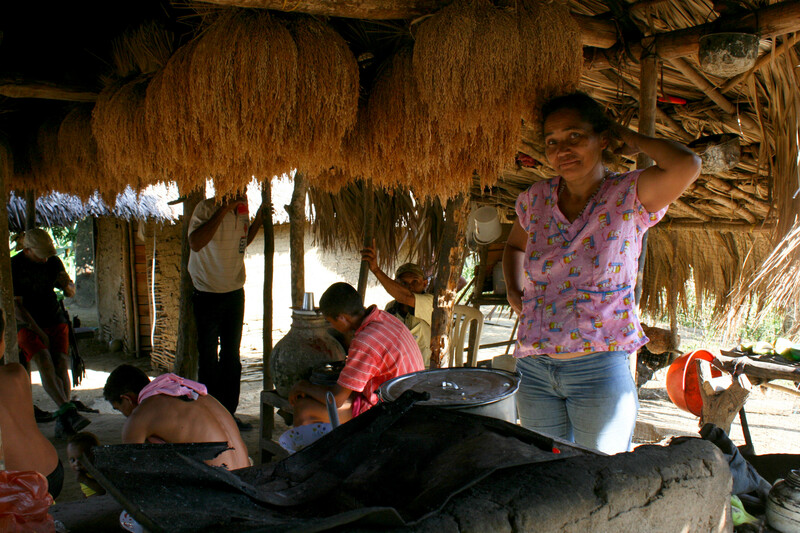 A year’s supply of rice hanging in a traditional rural home in the Montes de Maria. 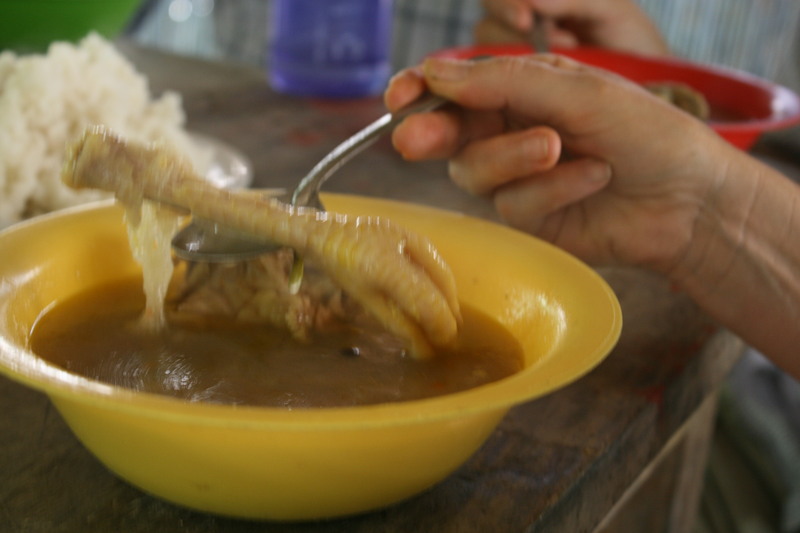 Over the past few years, I have meet not only chicken projects, but also rice farmers and seen the hard work, with very little profit, that they proudly engage in everyday to feed their families and their country. When I eat avocados, I think of the farmers in the Montes de Maria and the economic devastation they are facing, along with their determination to stay farming on their land. I still may not enjoy eating rice everyday, but I am trying to cultivate an appreciation for the work of the campesinos that feeds Colombia. To tell farmers their food is not something I want to eat, even when it is not the food I prefer, feels like throwing that work in their face. Understanding food’s context makes eating with a community of food producers a joy, not a sacrifice. I do think there are moments for expressing discomfort, especially as reminders that we come from different contexts and cultures, with all of the preferences associated with those backgrounds. Looking back, I can see with clarity instances where it would have been helpful if I had stated a frustration or hesitation, instead of blind acceptance, because it would have made made things easier in the future. In my house, therefore, I invite people to try other foods and try not to be offended when they don’t like them. In a country, and a global economic system, based on class and privilege, however, I do not want to perpetuate patterns of superiority and status, where my tastes are pandered to simply because of my background. The personal is, after all, political. That’s really funny and I suppose one answer to the question of why people would eat jello for breakfast. The canned hot dogs remain a mystery. Abrazos right back to you from sunny Bogota!